The last time I was in Los Angeles I made a point of driving by 9427 West Pico Boulevard, the location of my father’s Jewish bookstore from 1979 to 1990. 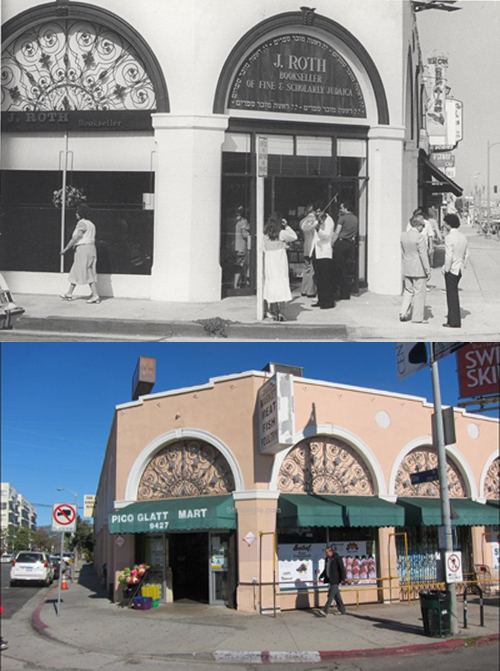 It was located in a small neighborhood known as Pico-Robertson, an area squeezed between Mid-City/Carthay Circle and Beverly Hills/West L.A. that was once a quiet residential neighborhood with a sleepy retail corridor along Pico and is now the bustling heart of Jewish Los Angeles. This map is from the Los Angeles Times’ Neighborhood Project, which provides a comprehensive profile of the Pico-Robertson neighborhood. Click on the map to visit the website and learn more about crime and schools in the area. 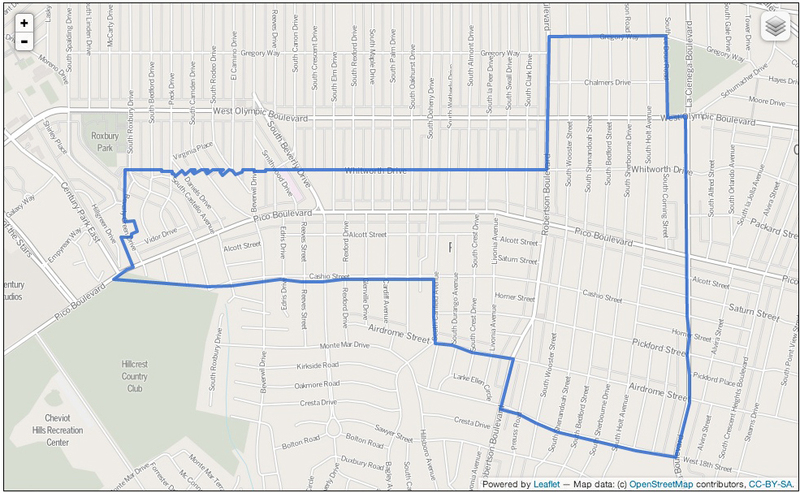 According to the Los Angeles Times’ neighborhood map of Los Angeles County, Pico-Robertson’s outline looks somewhat like a chubby axe stretching from La Cienega Blvd. on the east to Beverly Green Drive on the west, with West 18th Street the axe-blade facing south and Gregory Way the head’s poll to the north. The belly of the handle runs along Cashio Street and its back along Whitworth Drive. Almost 20,000 people live within its 1.03 square mile boundaries, which makes it one of the most densely populated neighborhoods in L.A. and L.A. County. These days the neighborhood is 73.5% white; not surprisingly, the most common ancestries are Iranian and Russian, and 34.6% are foreign born with the majority coming from Iran and Israel. 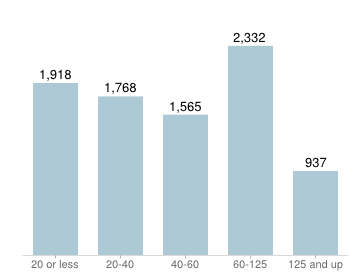 The median age is 36, the median household income is $63,356, and 48.3% of residents age 25 or older hold a four year degree, which is high for L.A. and L.A. County. There are 11 public schools and 12 private schools in the neighborhood; 8 of the 12 are Jewish schools. Harkham Hillel Hebrew Academy (K-8), which I attended, is the largest of the private schools with an enrollment of 405. Despite how Jewish the neighborhood might seem, its cultural diversity in fact reflects a range of peoples from Europe to Central Asia to the Middle East. This is evident in all the new store signs (new to me that is) that advertise Persian, Israeli, and traditional Eastern European/Russian Jewish products and foods. There’s also a vibrant kosher restaurant scene up and down Pico with a diverse selection of cuisines, suggesting that the neighborhood’s acculturated, middle-class demographic is aware of and open to the culinary influences and fads circulating through L.A.: MexiKosher, Jeff’s Gourmet Kosher Sausage Factory, Meshuga Sushi, Eilat Bakery, Kolah Farangi Kabob & Chinese Food, Bodhi-Thai Vegetarian & Vegan Kitchen, Brooklyn Pizza and Pasta. As I approach the intersection of Pico and Elm, where my father’s bookstore used to be, I must seem like an annoying out of town driver, my car slowing down in the now always heavy traffic, my head swiveling madly to check out what new developments have overtaken a block and a building I know better than any place in which I’ve since lived. Leaning over I see that, yes, Pico Glatt Mart, the kosher market that replaced the bookstore, is still there. What a food-obsessed street. And that’s all I can see with any clarity this time because the cars honking their horns behind me are making it clear that my nostalgia drive-by is holding up commuters with more pressing concerns in the present. But perhaps this experience is, in a metaphoric way, also the type of pause in space that the human geographer Yi-Fu Tuan considers a sign of place (Cresswell 8). That is, much to the consternation of my traffic mates the brief slowdown in time and space that I’ve created indicates that here at 9427 is a meaningful location, though one whose meaning at that particular instant is dependent on my memories and on me. Yes, the new immigrants and food trends that now define Pico-Robertson as a Jewish place reflect current global flows in people, consumer goods, religiosity, and especially capital as scholars like David Harvey would point out (Cresswell 58-59). I suppose I’d like the street to remain the same, to see my father’s bookstore and its unique collection of books as still in place and still an actor in the contemporary social and cultural mix of this Jewish neighborhood. My car seems to materialize both the fixity and the mobility that are at odds in such a social space (Cresswell 58). Still, the bookstore as a retail business is always on the move, always finding another version of “the proper environment for the sale of books” (40), to quote Laura Miller’s study of bookselling. If, as she points out, the consumer is sovereign in the modern version of bookstores then new choices and changes that serve the new customers in this neighborhood are inevitable, and so Pico-Robertson is very much a place in Doreen Massey’s understanding of the term: both a contemporary mixture and a historical layering of dynamic social relations, linkages, and memories (Cresswell 70). Or, as I experienced it, a moment’s traffic jam between my time and my father’s place. J. Roth Bookseller photos courtesy of Laurence Roth. Google Maps: Bodhi-Thai Vegetarian & Vegan Kitchen, Brooklyn Pizza & Pasta, Jeff’s Gourmet Kosher Sausage Factory.